Where Is Gold's Rally in Response to Yesterday's USD Weakness? Yesterday, the USD Index moved substantially lower while precious metals barely yawned. Why is gold not rallying? What does the gold-USD link tell us now, in combination with latest developments throughout the PMs sector? Lets examine these and many more clues together. One reason might be that gold is simply showing strength, as it doesnt want to move lower its waiting for factors on which it could rally. But we dont think that this the correct interpretation. There are multiple long-term bearish factors that remain in place and thus it seems that there might be a different interpretation. And there is. Actually, there are two reasons due to which this might be the case. First, gold is often reacting to major breakouts in the USD Index (and breakdowns), not necessarily to smaller moves that lead to the breakouts (breakdowns). The investors simply doubt that the USD strength will be upheld and dont sell their gold based on the above. Second reason may be the very recent discrepancy between the triangle-vertex-based reversals in the USD Index and the precious metals market. The USDX reversal took place earlier, so it may still be the case that the recent resilience of theprecious metalssector is a way in which the natural delay takes place. Consequently, the recent strength in gold may be no real strength at all. 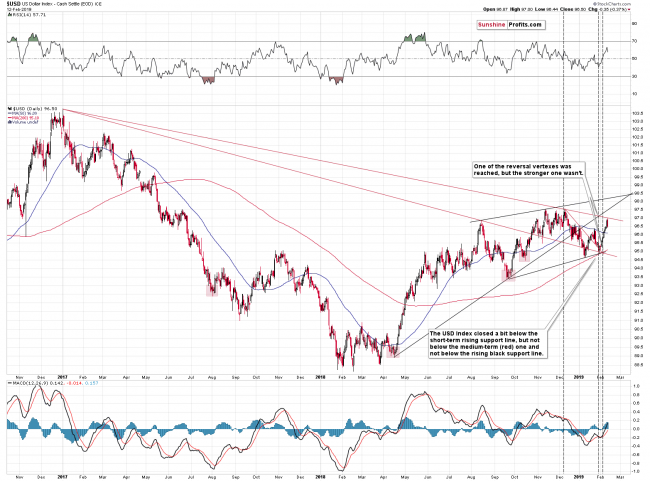 The USD Index moved to the declining red resistance line. Its not visible on the above chart, but the USDX moved a bit higher in todays pre-market trading and thanks to this, the above-mentioned line was reached. The line was reached, but not broken, so the fact that gold investors are hesitating seems natural. Moreover, the recent movement in the USD Index (approximately since the second week of January) looks like a corrective zigzag pattern. Thats yet another reason for traders to doubt the recent strength. Naturally, the big picture for the USDX remains bullish (and ourprofits on the EUR/USD pairkeep on growing even though we took part of them off the table yesterday). The fact that USD keeps on rallying since Feds dovish remarks (a strongly bearish factor for the USDX) is more important than the above assumptions. The USD Index has indeed corrected after moving to the declining resistance line. The key thing about this decline is that it didnt take gold todamoon. Gold and silver mostly ignored USDs decline despite early gains and mining stocks even declined.If golds previous lack of decline despite USDs strength was really a sign of strength, it would have rallied strongly yesterday. It didnt and miners even declined, which shows that it was not the factor behind the recent gold-USD dynamics. This further increases the chance that golds decline was simply delayed. Gold miners decline was important as it was the lowest closing price of the month and at the same time, it was the first daily close that was visibly below all the rising short-term support lines. The breakdown presented on the abovegold stock chartis now much clearer than it was before and theimplications of the above chart more bearish. Everything that we wroteyesterdayabout golds and silvers daily charts remains up-to-date, so instead of repeating it today, we will provide you with an update on two more long-term oriented factors. Most prominent features are both the triangles (created by two support lines starting from the late 2008 bottom and the declining resistance line thats based on the 2013 and 2015 tops) and the mentioned declining resistance line. Triangles help us with determining the time and direction of the nextturning point, while the resistance line obviously serves as a resistance. Here, we see that after reaching the second triangle, the gold-yen ratio indeed turned down (just as it did after reaching the first triangle top). However, it later made a higher low and turned up. Now comes the declining resistance line the ratio is so close to it currently that any room for further increases is minuscule. The odds favor a downside resolution, both in the ratio and in the price of gold. If not immediately, then shortly. 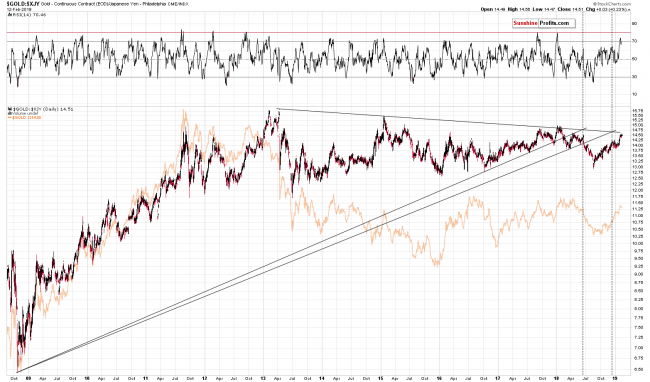 Most factors (including golds, silvers and miners triangle-based reversals) suggest the immediately scenario, though. 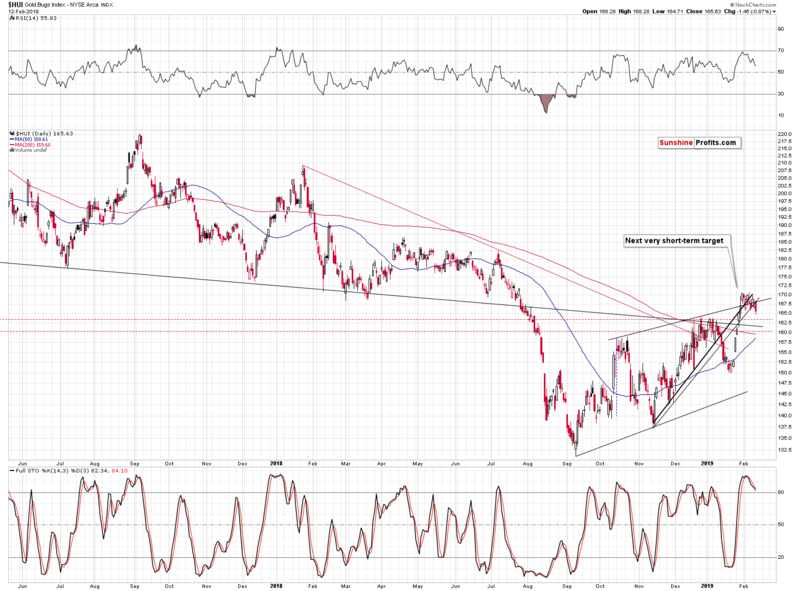 The weekly chart shows the yen to be after a verified breakdown below two rising support lines. These support lines have been drawn using either intraday or closing prices. The price is currently in the process of invalidation of the short-term breakout above both the rising support lines. Invalidation of a breakout is a strongly bearish development and as a result, we can expect the yen to head lower. 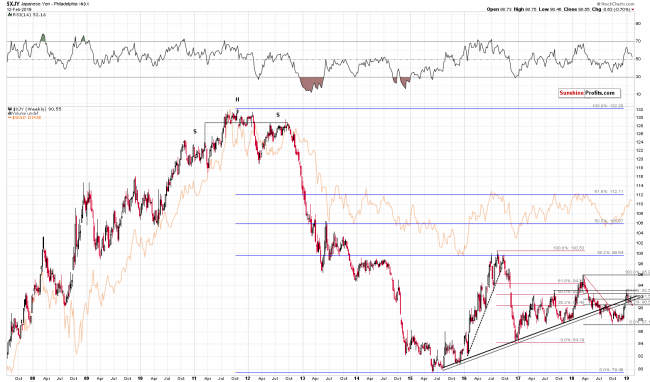 Remembering the strength of thegold-yen link, its one more reason for PMs prices to decline in tandem. Summing up, the recent rally and kind of resilience in the PMs complex may appear encouraging, but it doesnt change the medium-term trend and outlook, which remain bearish. It seems that golds reaction to the strength in the USD Index is simply delayed. The upside is quite limited, while the downside remains enormous. Thereversals have been reached last week. As PMs, miners, and the USD Index move beyond their reversal dates, the chance for any meaningful upswing in the former before medium-term declines continuation, is declining with the time passing. Naturally, the above is up-to-date at the moment of publishing it and the situation may and is likely to change in the future. If youd like to receive follow-ups to the above analysis (including the intraday ones, when things get hot), we invite you subscribe to ourGold & Silver Trading Alerts today. Przemyslaw Radomski, CFA (PR) is a precious metals investor and analyst who takes advantage of the emotionality on the markets, and invites you to do the same. His company, Sunshine Profits, publishes analytical software that anyone can use in order to get an accurate and unbiased view on the current situation. Recognizing that predicting market behavior with 100% accuracy is a problem that may never be solved, PR has changed the world of trading and investing by enabling individuals to get easy access to the level of analysis that was once available only to institutions. High quality of analytical tools available at http://www.SunshineProfits.com are results of time, thorough research and testing on PR's own capital. PR believes that the greatest potential is currently in the precious metals sector. For that reason it is his main point of interest to help you make the most of that potential. As a CFA charterholder, Przemyslaw Radomski shares the highest standards for professional excellence and ethics for the ultimate benefit of society. He also holds a master's degree in Finance and Banking, and is currently writing his thesis after having finished his PhD studies in Economics.